The Space Marines battle with dedication and zeal, brooking no hesitation, mercy or cowardice. Their weapons, armor and vehicles are highly suited to their shock role. All of these things combine to make the Space Marines the most fearsome warriors in the Imperium. The Chaos Space Marines have all of these strengths and skills, to which are added the power of Chaos and a brutal devotion to the Chaos Gods. Ever since the Horus Heresy, Space Marines have been tempted by the path of Chaos, whether for selfish reasons or greater ideals. Sundered from the Imperium, having turned their backs on the Emperor, these super-warriors know that there can be no peace for them, no forgiveness nor absolution. They are wholly committed to the path they now tread, for good or ill.
You may include a unit of Chaos Space Marines in your Chaos army as a Troops choice. 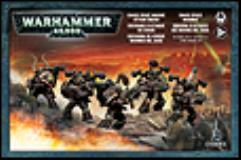 This boxed set contains enough plastic components to assemble five (5) Chaos Space Marines. All models are supplied unpainted and require assembly.